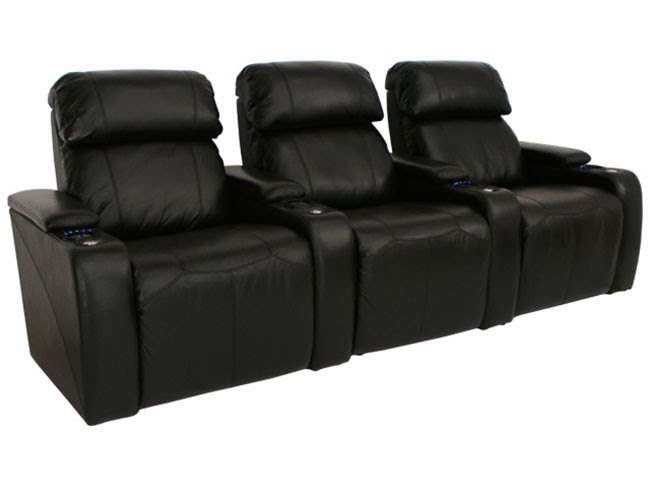 4seating is proud to present The Richmond, the newest in Seatcraft's deluxe line of Signature home theater seating. This seat takes everything that Seatcraft is known for to the next level of design, comfort, and innovation. The Richmond was designed with an eye toward clean lines and contemporary style, which will fit snugly into any home theater setup. The seat is presented in an impressive black onyx shade, which differs from regular black tones in the way it glistens when reflected in your theater's lighting. This shade will dazzle guests and keep the seat looking fresh and exciting for years. 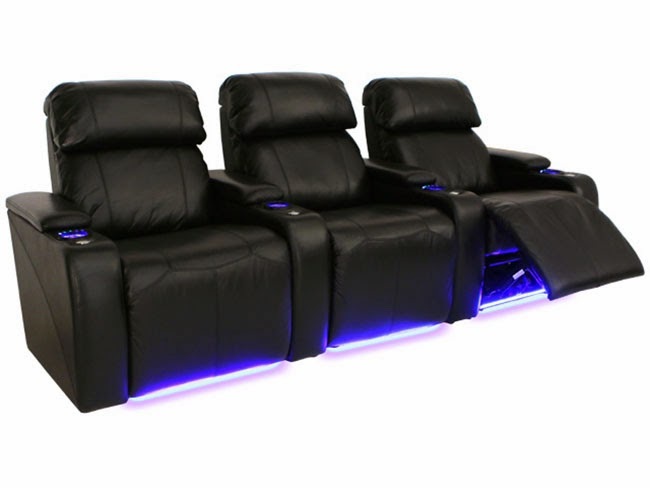 Black, of course, is one of the colors of choice for home theater enthusiasts as it blends well with just about any other color, while at the same time striking a sharp modernist feel in its own right. The Richmond is made from Leather 7000, a high-end grade of top grain leather that is carefully chosen from the top third of all hides and then buffed to a smooth, richly textured finish. This premium material is enhanced by the black onyx shade, and works to give the seat its luxury image. The leather's plush, irresistible softness will wrap around your body, contouring to its natural shape and leaving you more content each time you relax. In addition, the material is easy to clean--simply take a lightly damp cloth to wipe away any dander, and your seat will look just like new. Leather is known for its exceptional ability to improve in appearance and texture with age, making it an outstanding investment that keeps delivering. The Richmond's seat back is dominated by a large, overstuffed headrest that gives your head and shoulders a wide, sumptuous berth. Use a simple power button to adjust the headrest to any desired position, so that your upper body receives just the right amount of comfort and support to fit your unique requirements. Use the same power buttons on the armrest to control a full chaiselounger, which allows you to stretch your lower body with a firm buttress under the legs, that eliminates the usual gap between the seat and footrest. A special "wall-hugger" design allows the seat to remain just three inches from any wall, even in full recline. This provides for a more efficient use of space, without sacrificing an ounce of comfort! The Richmond is completed by several attractive features which make it a standout. Lighted up holders will keep your drinks outlined with a soft azure glow that keeps them close at hand and easy to find in a darkened room. Meanwhile, ambient base lighting provides a sharp azure accent at the bottom of the seat, allowing you and your guests a discreet means of finding your way. Included black tray tables provide a polished space for needed items, that is easy to maintain--and when finished, simply lift up the armrests to place any remotes, snacks, laptops, reading materials into generous storage compartments located within. With powered headrests, a power chaiselounger, lighted cupholders, and more, The Richmond is clearly at the vanguard of hi-tech convenience. Match this with a deluxe Leather 7000 finish in a gleaming black onyx tone, and the seat is quite simply a new pinnacle of Seatcraft design.